Sometimes the “value” of museum objects and specimens are not totally clear to everyone within a multi-disciplinary museum like the UA Museum of the North. Even other professionals who have similar academic backgrounds might be confounded when walking into the Ethnology & History lab to examine new acquisitions being processed by myself or our department staff. Today’s query came from our Curator of Archaeology, who also happens to be my husband. 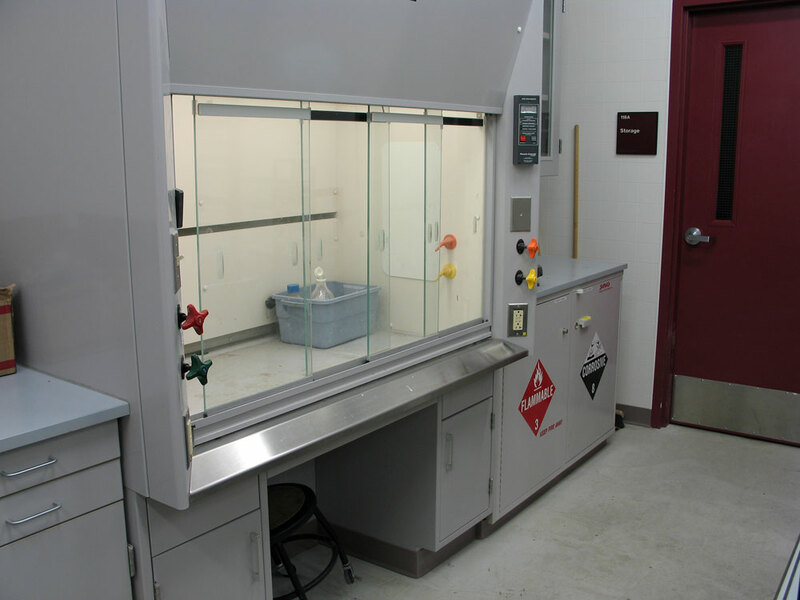 “Why do you have that?” he asked as he entered the lab, motioning to a large object I had just finished cataloging and photographing. I turned to see what he was referring to, ready to provide the historical context of items ranging from a gold mining tool chest, a Yukon match tin, Alaska Native baskets, polar bear sculptures, and the item in question, a sample of the exterior wall construction of the renovated museum building from ca. 2005 (UA2015-007-0003). Museum wall section demonstrating the construction of the exterior walls. UA2015-007-0003. UAMN Photo. 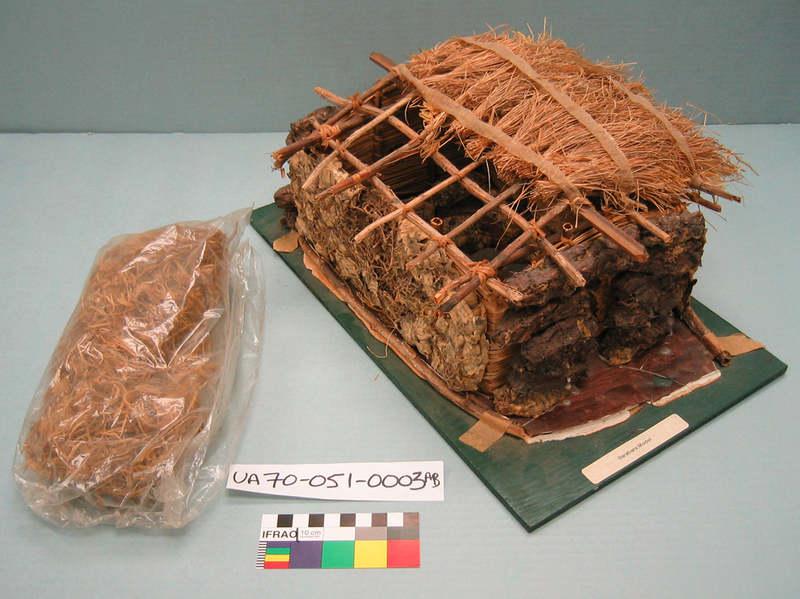 This model was used by the Museum’s Alaska architects of record, GDM, Inc. for public events to demonstrate the incredible lengths the engineers went to in order to build a stable and tight building envelope to house our irreplaceable collections. Last year the museum’s acquisitions committee approved the transfer from the Exhibition & Design department, where the wall section had been stored for the past ten years, into the History collection for long-term curation. 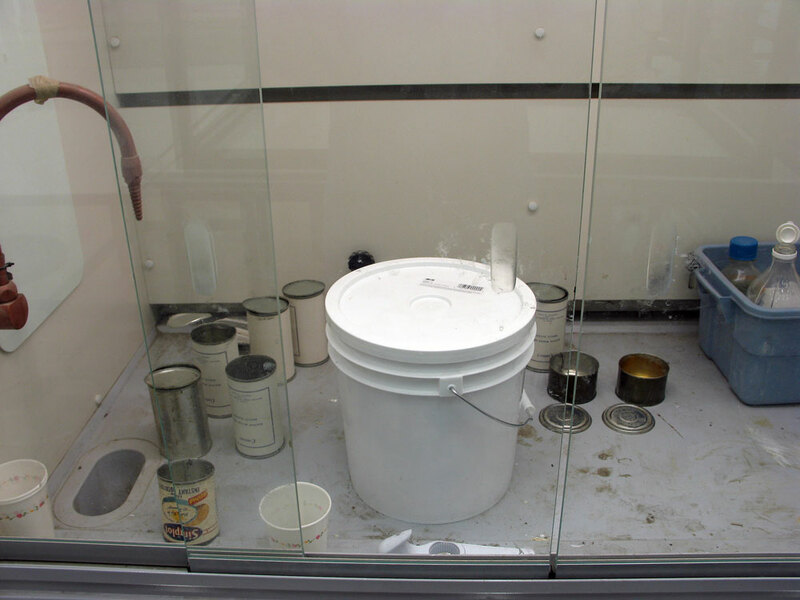 This process transforms the wall section from an “object” to an “artifact.” Once this transition occurs, this item joins a growing collection that helps to document the 90-year history of the University of Alaska Museum. Items in the history collection that document the museum’s changes over time include t-shirts, employee name badges, brochures, magnets, and blankets. These items show the museum logo and the way the museum represented itself to the public through souvenirs sold in our store. We also have items that relate to the building itself. Documenting the 2006 renovation, we have items like the wall sample, but we also have symbolic artifacts like one of the golden spades used during the 2002 groundbreaking ceremony by Museum Director Aldona Jonaitis (UA2002-017-0001); the first piece of the museum building that was knocked off for the renovation process (UA2006-002-0007); and two impressive architectural models of the building that represent two very different visions of the expanded and renovated museum (UA2015-007-0001 and UA2015-007-0002AD). A ca. 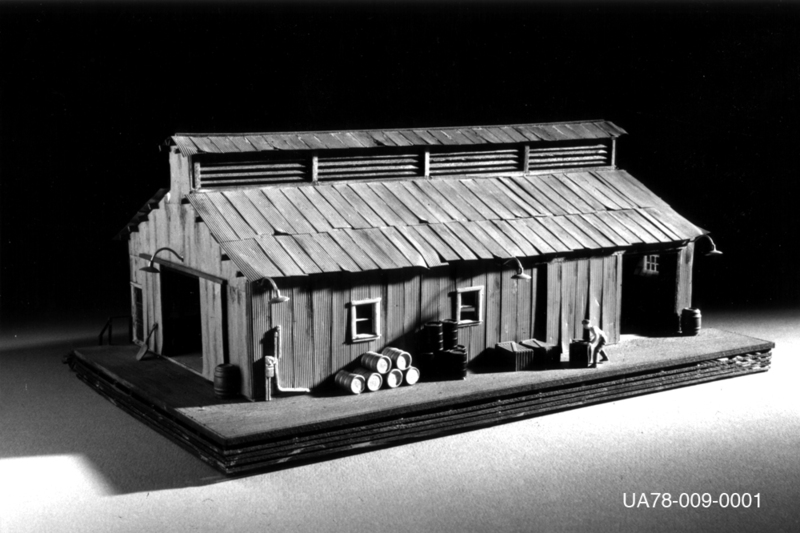 1994 architectural model of a proposed expansion design of the University of Alaska Museum of the North. Made by Bezek-Durst-Seiser Architecture and Planning, Anchorage. UA2015-007-0001. UAMN Photo. 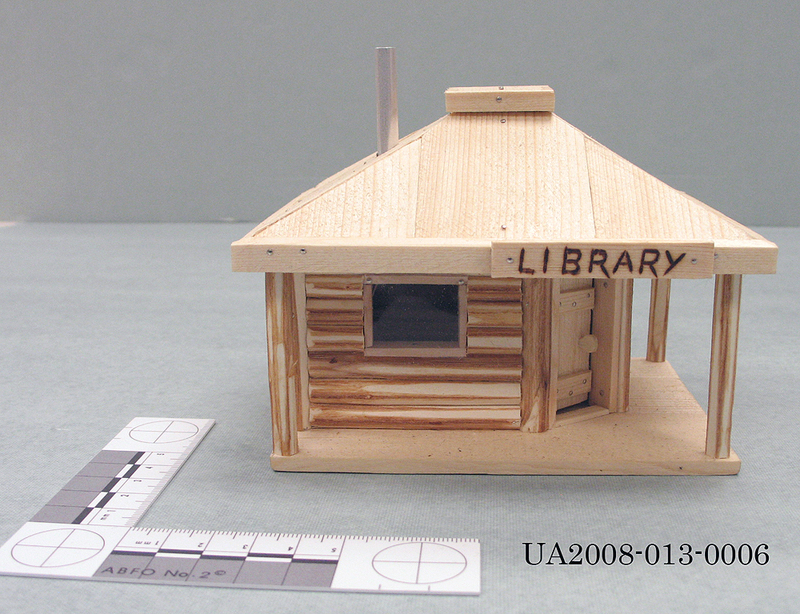 Architectural model of the actual design for the UA Museum of the North, designed by HGA Architects and Engineers and constructed by Feyereisen Studios, both of Minneapolis, MN. UA2015-007-0002AD. UAMN Photo. Some of these items, on their own, might warrant a question from a curious passer-by, about the “museum quality” nature of the collections. Do paper shipping labels, shopping bags, and post cards tell us anything about the nature of the museum, about the institutional values, or the role of the institution in the community? Some more than others, but as the collection grows and is supplemented by historical photographs, museum-produced videos, and oral histories, these ephemeral items that were designed to be part of the every day operation and business of the museum, will help illustrate the our growth into a world-class research museum of natural, cultural, and art history focused on the circumpolar north. University of Alaska Museum, ca. 1951. 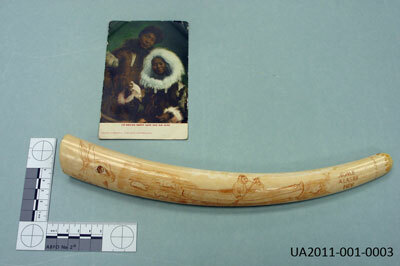 Alaska and Polar Regions Collections, UAF; John Sigler Photograph Collection. 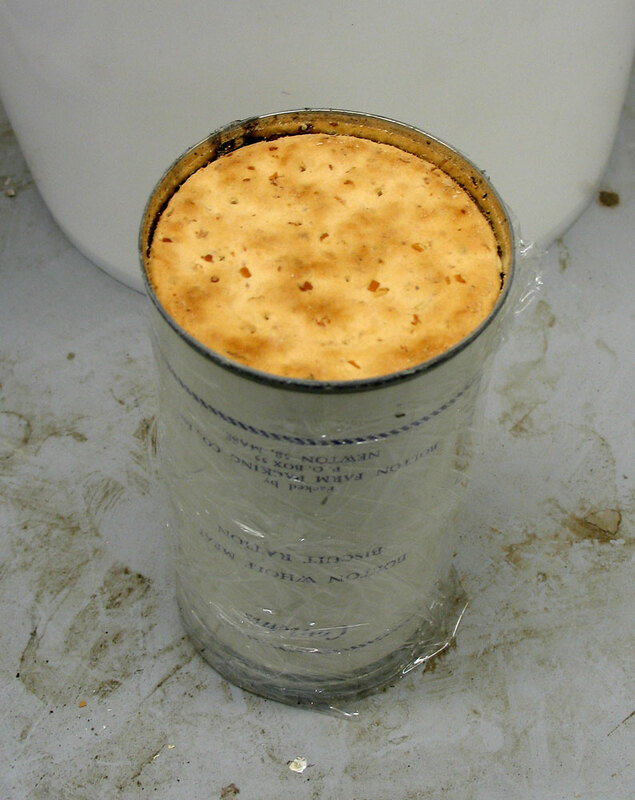 UAF-2004-111-1140. Over the past six weeks the Department of Ethnology & History at UAMN has hosted a graduate student intern from Indiana University, Purdue University, Indianapolis (IUPUI). Rebekah Ryan is about to earn her MA in Museum Studies. This summer she traveled to Fairbanks to expand her experiences in collections work, working on archival enclosures for artifacts, taking photos of the collections both in the studio and lab, learning how to use the new Arctos database, and undertaking research in the collection. 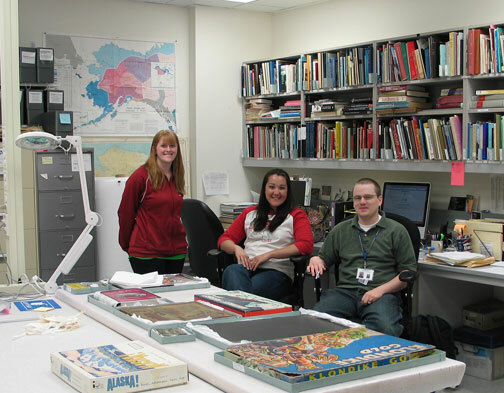 Each year, our intern creates an exhibition at the UAF Rasmuson Library in order to put their collections-based skills to a practical end. Rebekah was intrigued by the UAF Math in a Cultural Context program after a group of elders visited the museum to view objects. She developed the following ideas using our collections to illustrate concepts of symmetry in Alaska Native Design. You can see her exhibit at the Rasmuson Library 4th Floor, near the reference desk. If you want more information on this topic, you can add a comment below. What is symmetry? Most of us have an instinctual sense of what symmetry looks or feels like, but it can be difficult to define. Dictionaries define “symmetry” with synonyms: balance, proportion, harmony, consonance. In Western mathematics, “symmetry” is a correspondence in size, form, and arrangement of parts on opposite sides of a plane, line, or point. When creating things to use and appreciate, people often respond positively to balance: symmetry of design or ideology. This broader definition of symmetry is a common element of Alaska Native designs, from using body measurements to craft custom kayaks and parka decorations, to representing the cycle of the universe. 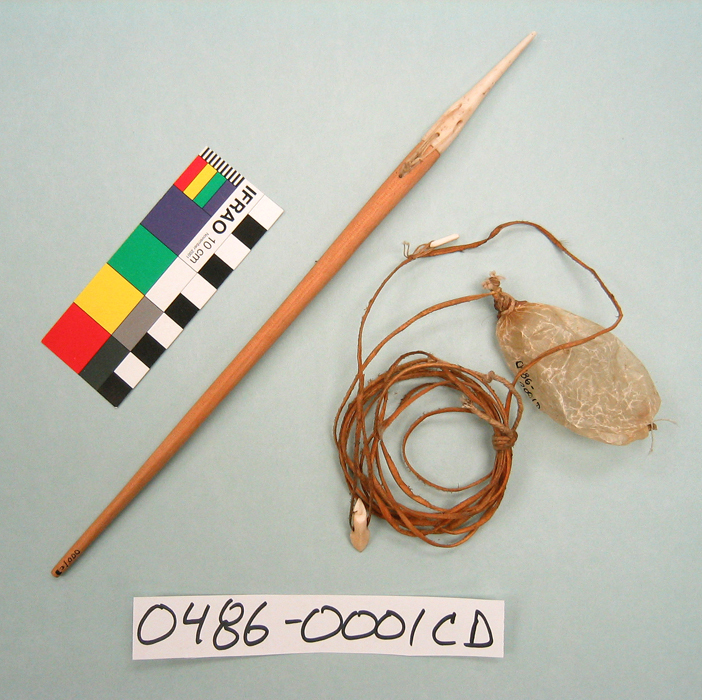 Many Alaska Native items were custom-made for their intended owners – symmetry of the tool and its user. 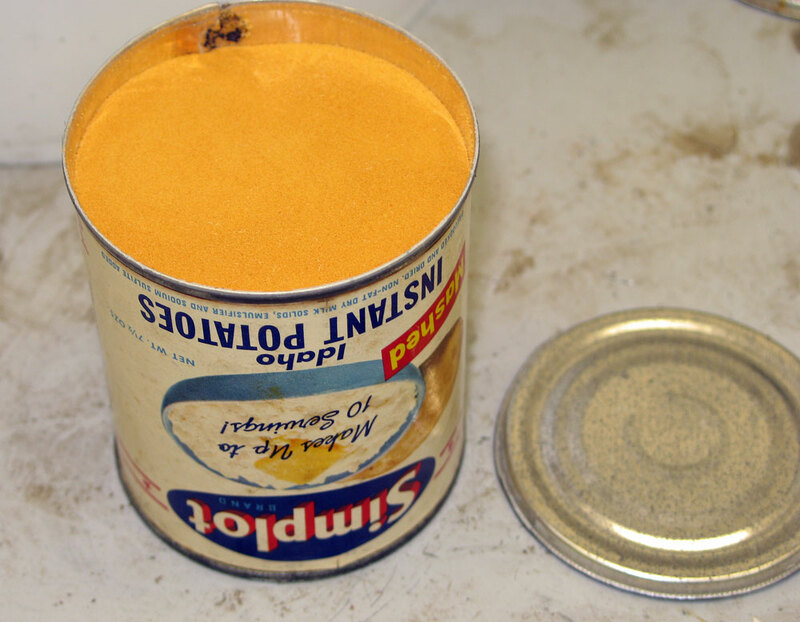 One of the ways to do this was to use an individual’s body to make measurements for that item. 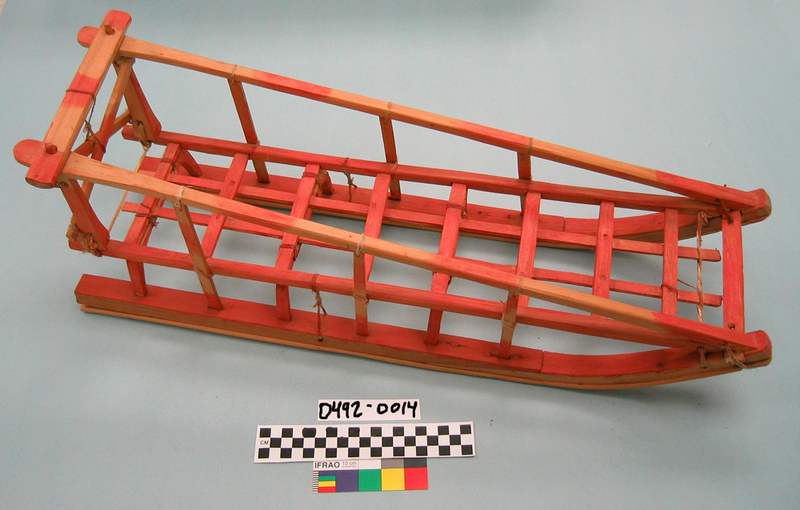 Over time, the Yup’ik peoples developed a system of anthropomorphic (body) measurements and proportions that would create an agile and dependable kayak, or tailored clothing with symmetrical decorative patterns. 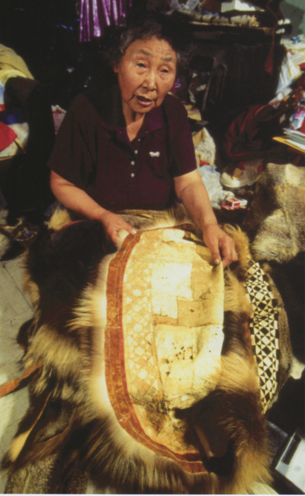 Skin sewing has been a fundamental skill for generations of Alaska Native women: sound stitches protected their families during all kinds of weather. Patterns are often unique to a family or person, and when incorporated into clothing, are an important means of communicating identity. When making a skin-sewn decoration, Yup’ik women have traditionally begun with a square based on an individual’s finger measurements. Once the square was folded along its lines of symmetry to confirm that it was perfect, the square could be divided into other shapes – squares, triangles, parallelograms – even circles. 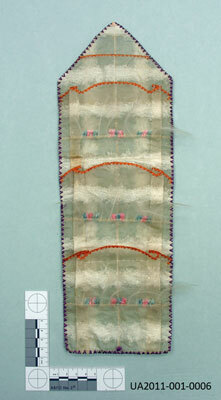 Fannie Barr Displays the Interior of the Parka to Show Emily Barr’s Sewing on the Back of the Border. 2006 Photographer: James Magdanz. Courtesy Shared Beringian Heritage Program. 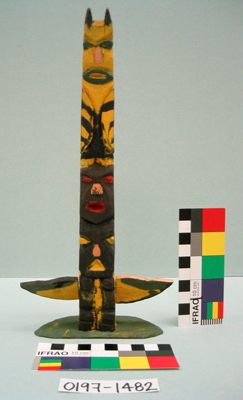 While early Alaska Native designers didn’t employ the same conceptual labels for symmetry that are used in Western mathematics, Western concepts can still be illustrated by Alaska Native objects. 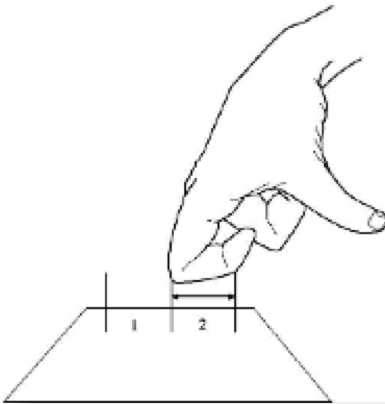 The three fundamental types of symmetry are linear, radial, and point. 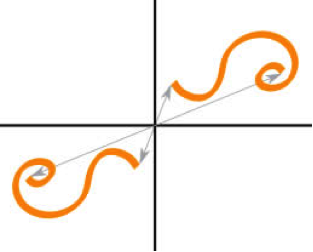 A shape or design has linear symmetry when it can be folded on an imaginary line into two halves that could lie perfectly on top of one another. When something has radial symmetry, an imaginary line can run through the object, and the object can rotate on that imaginary axis in such a way that the patterns on it will repeat themselves before making a full rotation. Radial symmetry can be present on something round and flat, like a plate, or something spherical, like a ball. Point symmetry is a bit more complicated to understand. 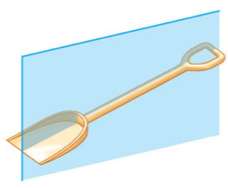 A design displays point symmetry when an element can be flipped 180º over an imaginary point to lie perfectly on the other element. 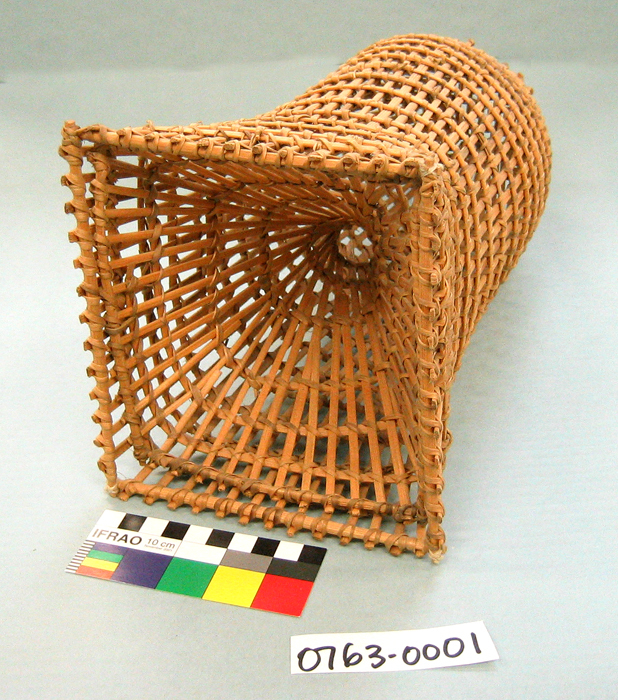 This spruce root basket displays examples of linear and rotational symmetry on its side, lid and bottom. 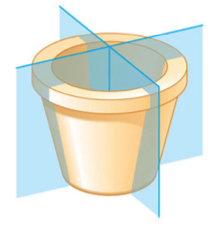 The final type of symmetry – point – can also be seen on the side of the basket. 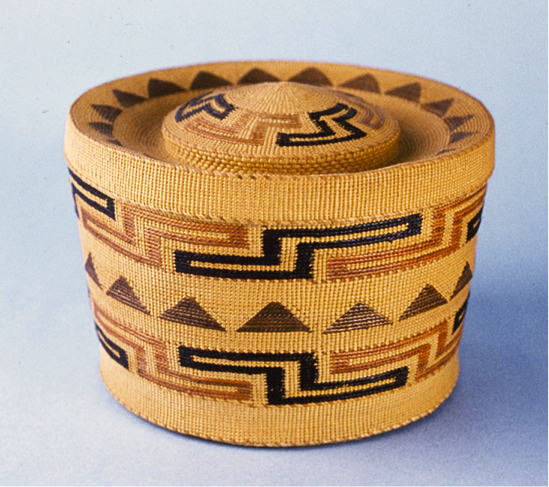 The “s” and “z”-shaped design is called the “shaman’s hat”, and the bands on the top and bottom face opposite directions. A black “z” that is diagonal from a black “s” could be flipped up and over an imaginary point between those two figures to lie perfectly on top of that black “s”. 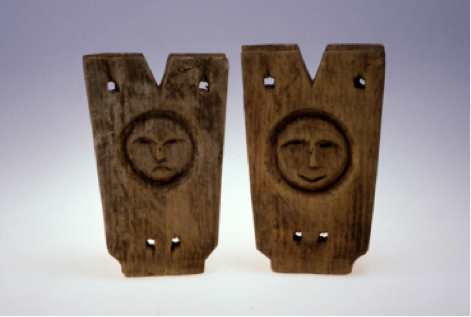 While it may seem to be more abstract than literal examples of symmetry, ideological symmetry plays an even more fundamental role in Alaska Native design. This can be seen in balanced representations of male and female forces, and depictions of the cyclical nature of the universe. 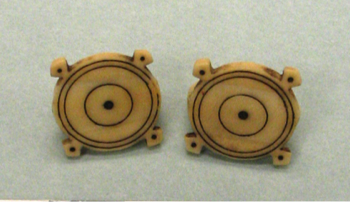 These earrings are decorated with the “circle and dot” decoration. 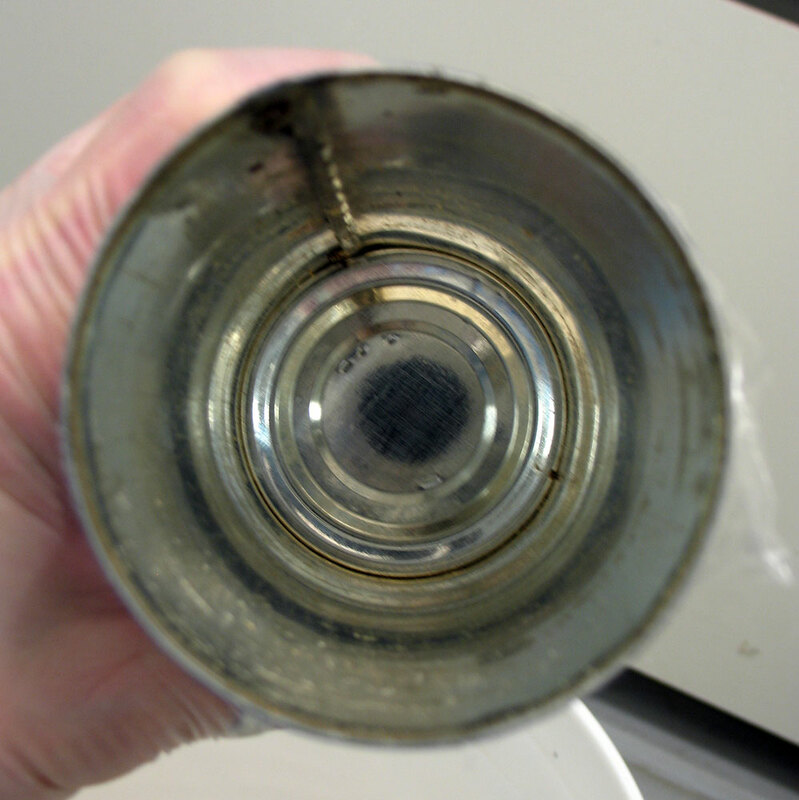 A Cup’ik designer drilled the first hole, and used sharpened bone or metal tubes to carve concentric circles. When surrounded by four smaller dots, the circle and dot design has been identified to represent the pathway between the world of the living and the dead, and is associated with spiritual insight. These kayak stanchions are used to physically and ideologically support a kayaker when he’s in the cockpit. The smiling male face and frowning female face represent the necessary balance of good and bad spirits in the universe; they protect the kayaker as he travels. Notice the bilateral and radial symmetry of the foundational flowers and asymmetrical arrangement of the surrounding motifs creates a balanced decoration. Alaska Native design is vibrant and complex, incorporating symmetrical properties that serve practical, aesthetic, and ideological purposes. 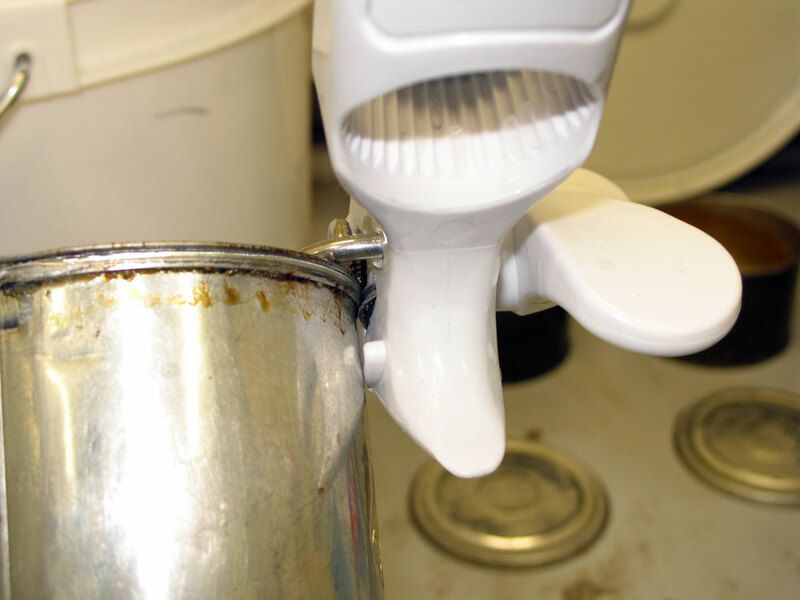 Many of these techniques have been perfected over generations, and continue to be integrated into contemporary design. Want to learn more? Use this guide to explore symmetry in Alaska Native Design throughout the Museum of the North! 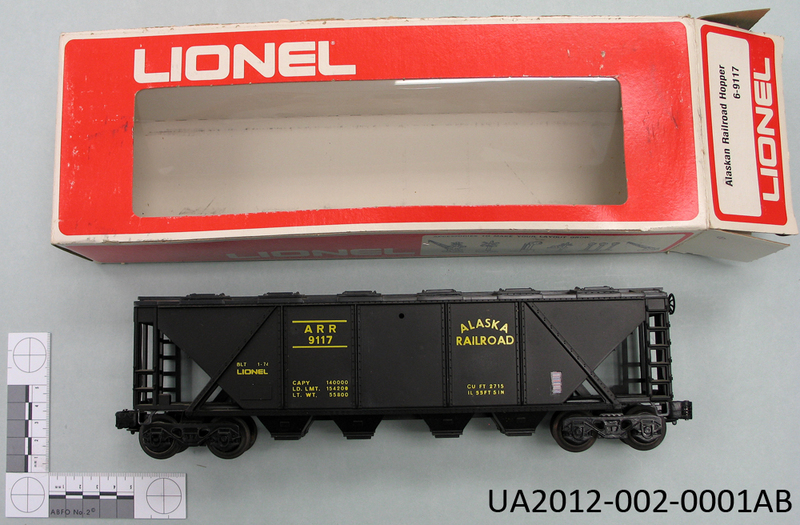 It’s Small… but is it a Model or a Miniature? Collections people, like collections managers and registrars, sometimes ponder (and debate for hours) the strangest things. Do we use Last Name, First Name or First Name Last Name? Inches or Centimeters? H x W x D or L x W x H ? Organize by object type or by culture? If you have any idea of what I’m talking about, you probably should work in the collections department of a museum, if you don’t already. 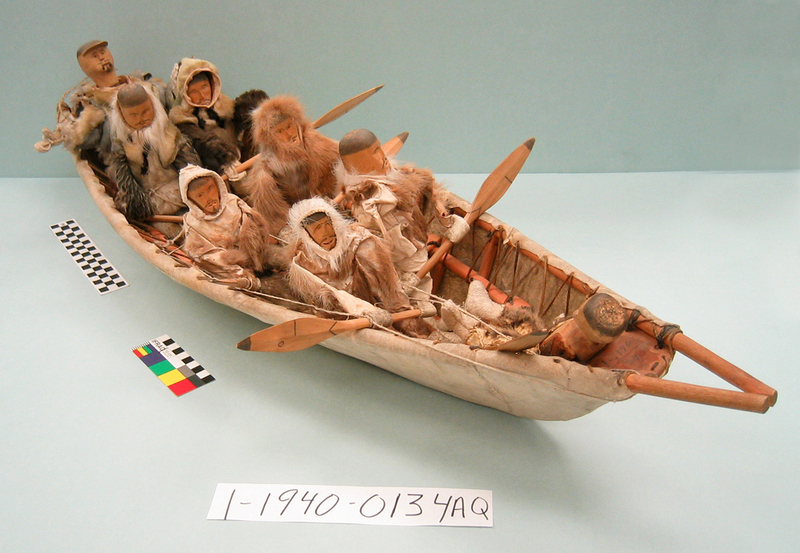 The most recent discussion in the Ethnology & History lab at the University of Alaska Museum of the North surrounds the difference between “models” and “miniatures” and which is the preferred terminology for most of the small versions of full-sized things we have in the collection. Della Hall, Ethnology’s skilled and knowledgeable curatorial assistant, had many good points to counter some of my own. As with many debates surrounding collections-issues, we started by looking at a couple of nomenclature books. Chenhalls didn’t even have “model” as a classification. Next step? Google it! Nothing definitive pops up. Dictionary? Of course! Miniature: noun: A copy or model that represents or reproduces something in a greatly reduced size; adjective: Being on a small or greatly reduced scale. Yes… now we’re getting somewhere. And now the other? Model: noun: A small object, usually built to scale, that represents in detail another, often larger object. Okay, when they use one word to define the other, I know we’re working on a good problem of distinction, but one that when determined, will prove a valuable standard. So after further discussion and examples, here’s what Della and I have decided will be our definition and standard for usage. MINIATURE: All objects in the collection that are simply small versions of their full-sized counterparts. 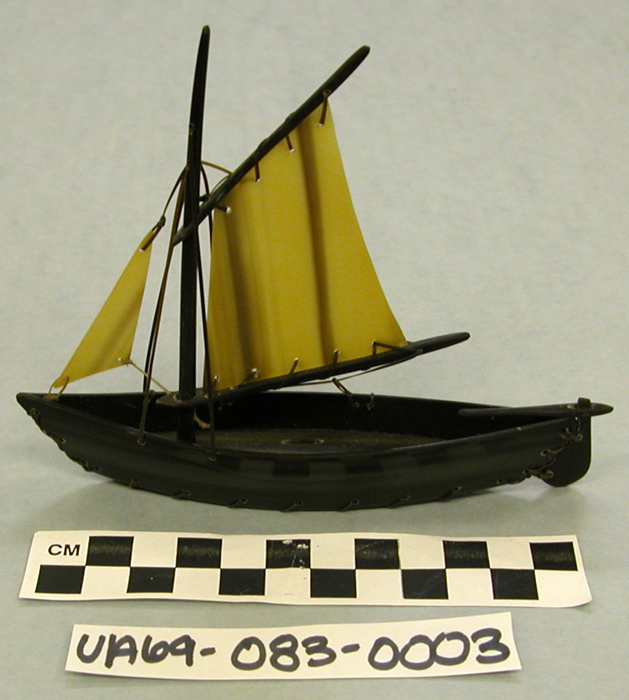 For our Common Name field in the database, we might find examples such as: Kayak, Miniature; Canoe, Miniature; Cabin, Miniature; Snowshoes, Miniature; etc. 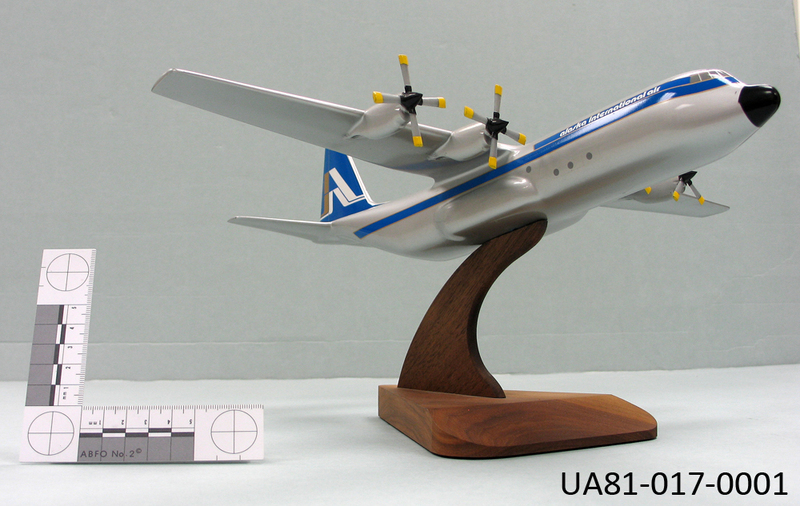 MODEL: Any objects in the collection that are intended to be exact replicas of their full-size counterparts, at a pre-determined and standardized ratio of miniaturization (i.e., “scale models”). 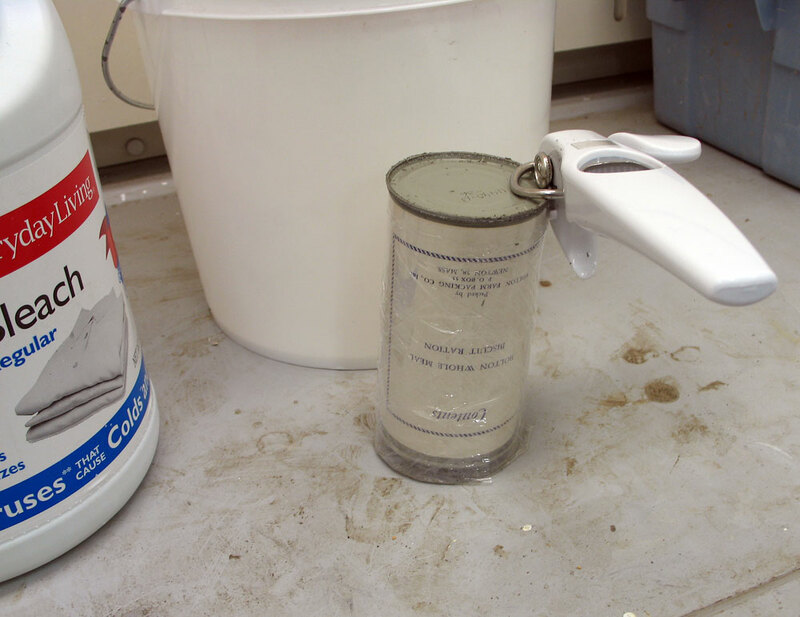 This will likely be items that are manufactured, and the scale verified and consistent across the entire piece, such as: Train Engine, Model; Airplane, Model; Automobile, Model; Sternwheeler Boat, Model; etc. While this may not end up being a perfect system, and certainly seems to go against our vernacular (i.e., “model kayak,” “model totem pole,” “model sled,” it seems to be based on solid rationale and can be duplicated time and again. 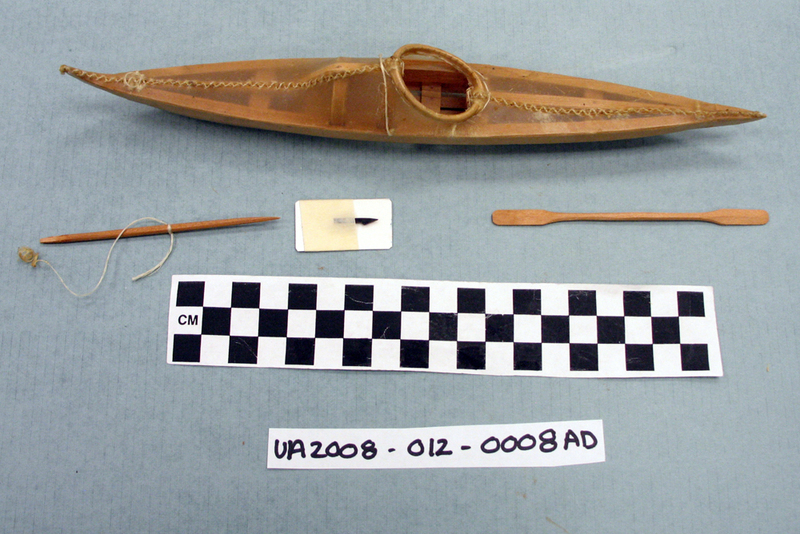 It could be argued that the hand-made miniature kayaks that were produced by master Native artists are nearly-perfect replicas of the full-sized items in our collections, and very possibly scale models of them. 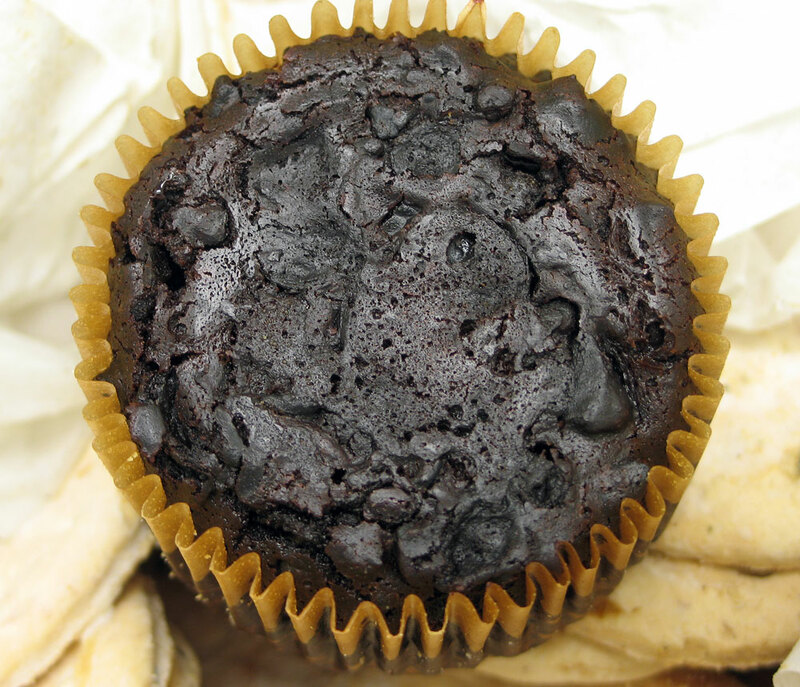 However, it would be challenging for us to make that determination for each and every piece. And it would lead us to inconsistencies between those items that are scale models and those that are not but are the same object-type (i.e., some kayaks might be models, while others will be miniatures). 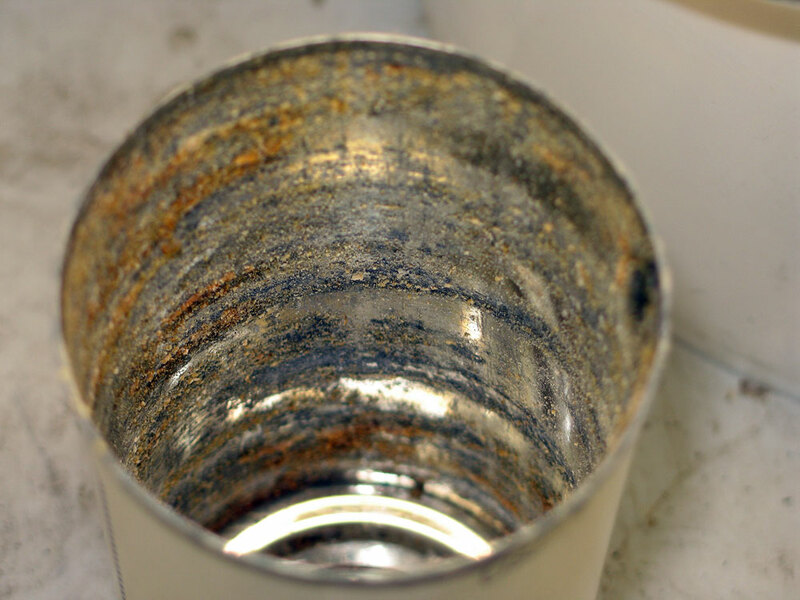 Here’s a selection of images to illustrate this standard. All photos copyright UAMN. As always, I welcome feedback regarding this standard! 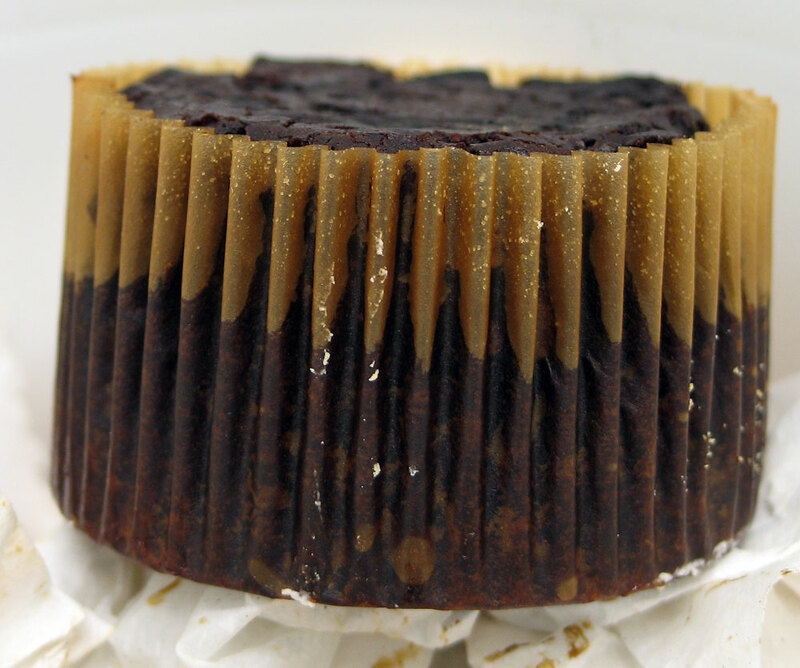 Miniature boat made from baleen. Miniature umiak from Point Hope. 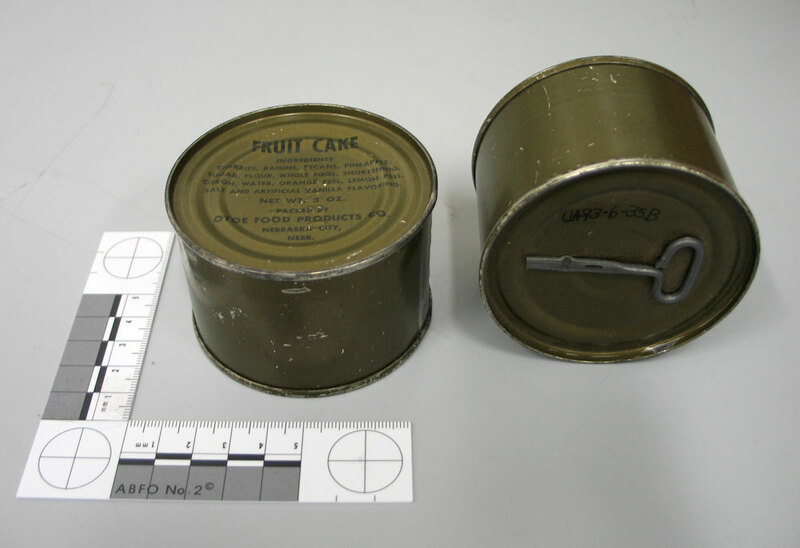 When you’re working with a local history collection, you never know the kinds of things that will present themselves. One of the most difficult things to know is what will be important for future generations to understand our current time; what should we be keeping in order to most accurately convey our place in the history of Interior Alaska? As a former UAF student and local musician, Joshua Reuther was quite familiar with The Marlin, a local pub close to campus and known for its “close quarters” and eclectic musical performances. While working many years ago at The Doghouse (now Pad Thai Restaurant) he was given a Blue Marlin t-shirt by the owner Gerry Ostrow. As with most pubs, the Marlin had undergone changes in ownership and with that change, a slight variation to the business name. The Blue Marlin name represents the bar at a time prior to ca. 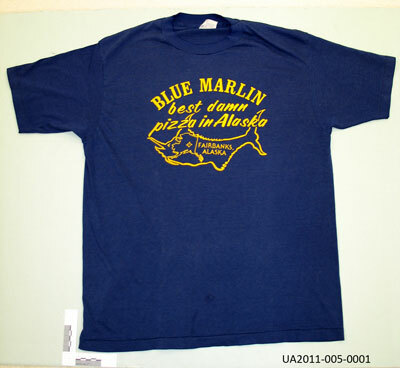 1996 when it was known for having the “best damn pizza in Alaska,” according to this t-shirt. While it may seem odd to have a t-shirt in a museum collection, we actually have 13 such shirts! We find that t-shirts are a straightforward technique for representing pop culture of a local community, with their period-specific graphics and messages. 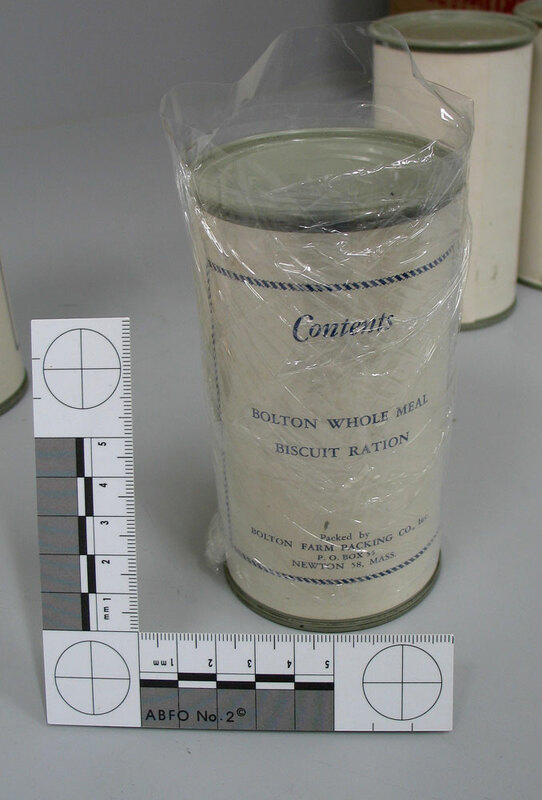 They are ubiquitous, and therefore, a veritable requirement for a history collection. 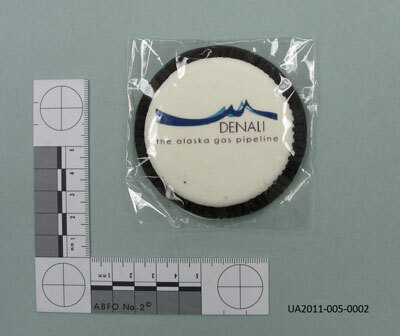 Denali cookie handed out to VIPs who attended a big-top tent celebration at Tok, AK, summer 2008. Vehicle magnet, given to contractors to signal their participation in the project. Flying disk, used during the summer 2011 at the Meade Site, a UAF archaeological field school sponsored by Denali. 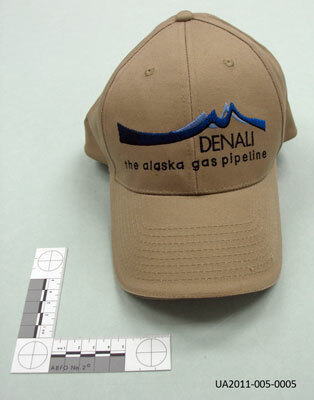 Baseball cap bearing the Denali logo. 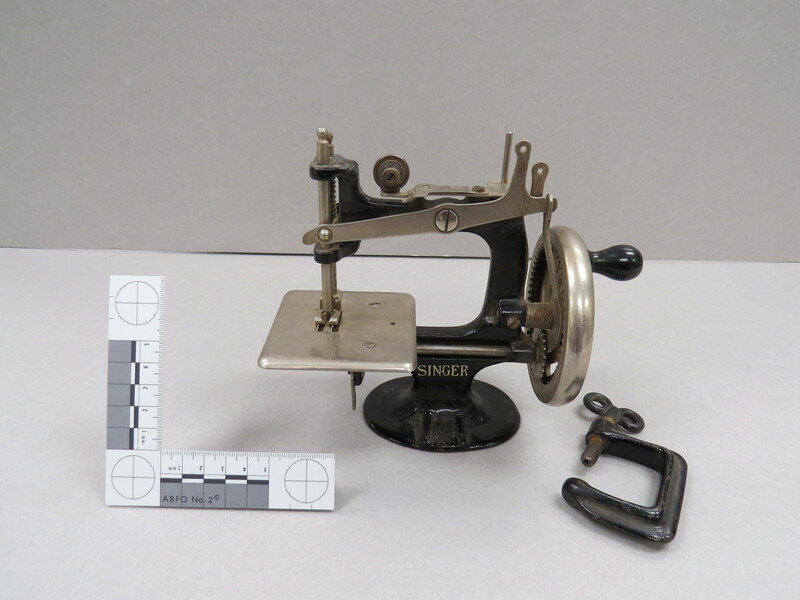 Also donated by Reuther, an archaeologist who works for Northern Land Use Research in Fairbanks, are a collection of items used by NLUR while working on surveys for Denali – the Alaska Gas Pipeline project. 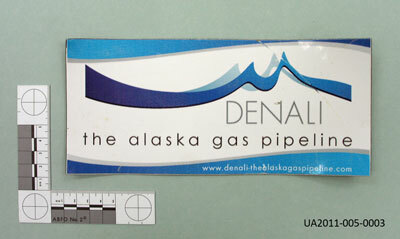 The company, an LLC of ConocoPhillips and BP, formerly closed their operations on May 17, 2011 citing “a lack of customer support.” This controversial company was conducting the preliminary surveys to move forward on a route to bring natural gas to the Lower-48, while the state of Alaska was working on a separate route through the AGIAprocess. 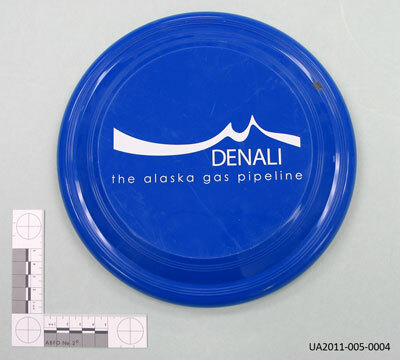 These four artifacts bear the logo of Denali and were distributed to contractors as part of their advertising campaign and will now help serve as symbols of this story of one of the first “boom and busts” of the gas line process. Polar bear carving by QAY. 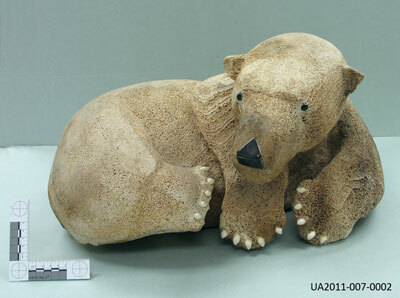 Polar bear mother and cub, carved by QAY. Grace Schaible has long been a friend to the UA Museum of the North. Grace is known for being Alaska’s first female attorney general (1987-1989) and an avid art collector. 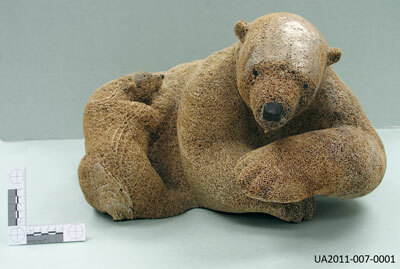 A major component of Grace’s collection are representations of polar bears, both in 2D and 3D. In 2011 she donated two very large whale bone carvings of polar bears, carved by Ronald “QAY” Apangalook (Qaygeghutaq) originally of Gambell, St. Lawrence Island, Alaska. In these two lovely pieces, QAY uses baleen for the eyes and nose and in the single bear, walrus ivory for the bear’s claws. 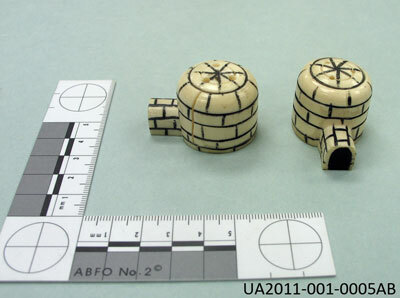 Pieces like this are especially welcome in the Ethnology collection because whale bone is a relatively stable medium that can hold up to more lengthy exhibition periods and slightly more variable environmental conditions (compared to more vulnerable materials like dyed skin or grass or sculptural materials like wood or walrus ivory). 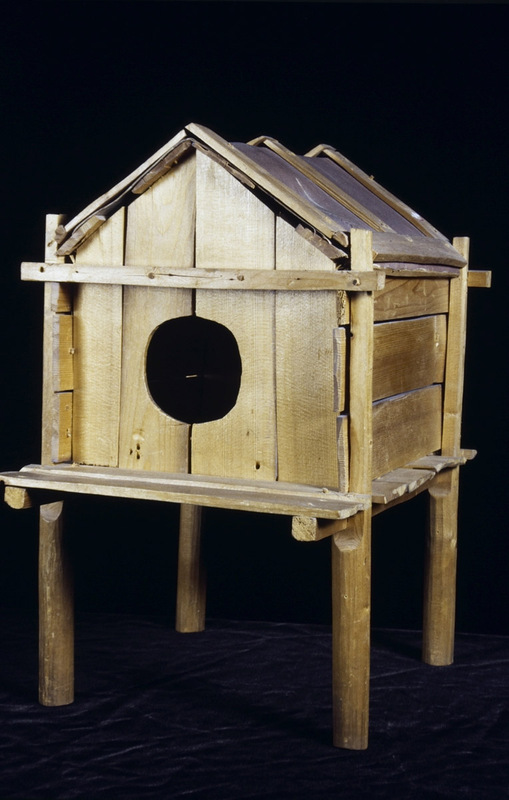 "Porcupine Nest" by Craig E. Dorman, 2010. Donor: Craig E. Dorman, Ph.D.
One of the last donations of 2011 is an incredible set of seven nesting baskets, made by the donor, Craig E. Dorman. Dr, Dorman is a past director of the Woods Hole Oceanographic Institute, retired rear Admiral and program director for anti-submarine warfare in the Space and Naval Warfare Systems Command. 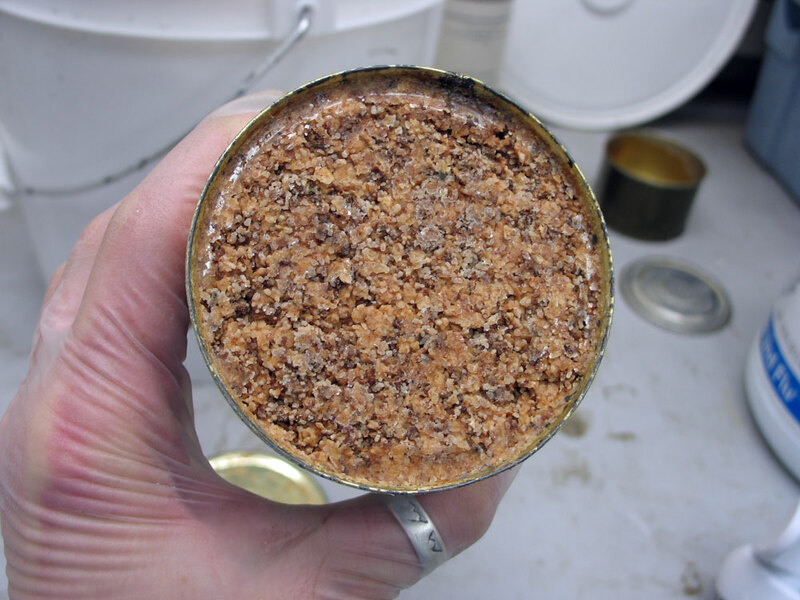 Most recently, Dorman was the Vice President for Research with the University of Alaska. 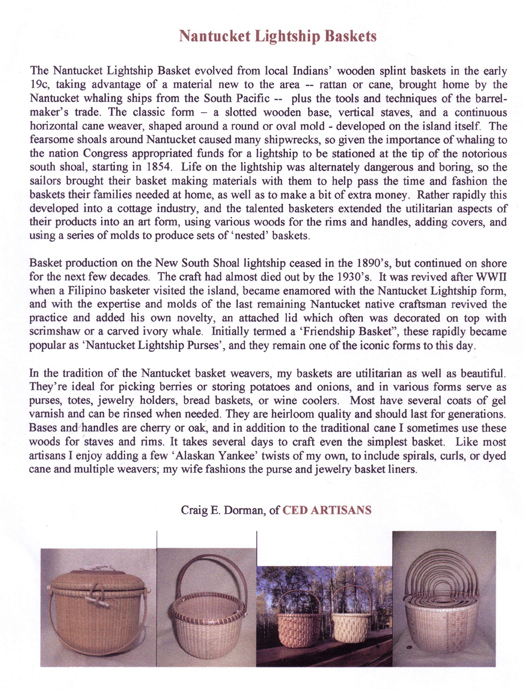 Dorman produces these baskets, known as Nantucket Lightship Baskets, now that he is retired. He documents them with great detail and the workmanship is outstanding. 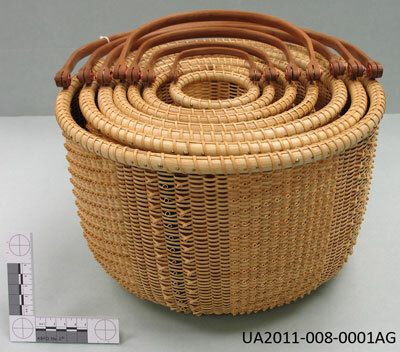 His innovations include tiny twists in the weavers and staves that are dyed or made from varied materials, as in these baskets. In this set of seven tightly-nested baskets there are a total of 4915 curls! 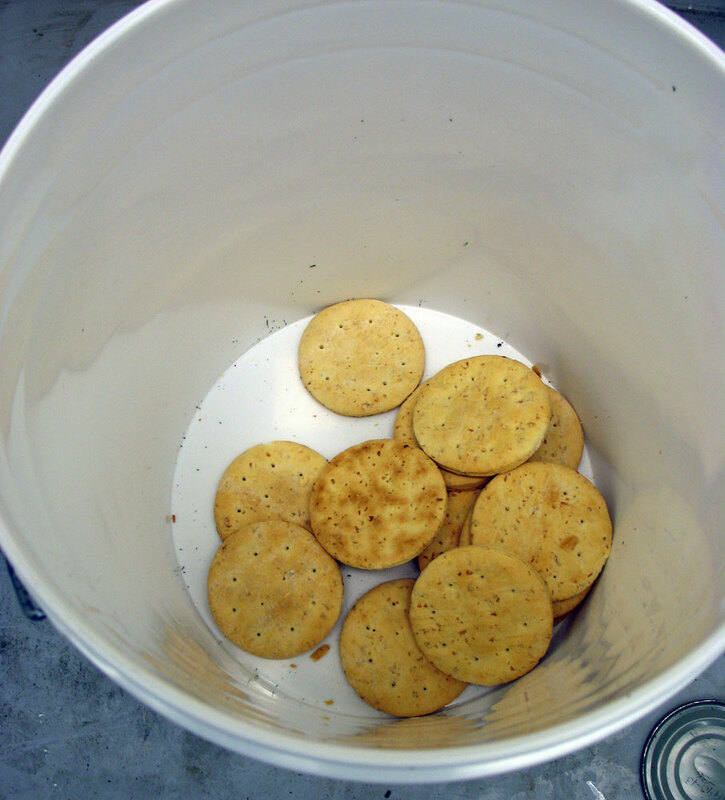 This tiny detail is one of the reasons this group of baskets won the Division 10 Grand Prize at the 2011 Tanana Valley State Fair. We are proud to be the new owners of this treasure. 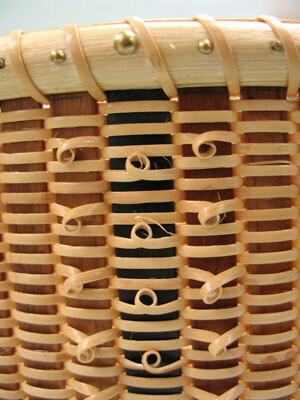 The inside of the outermost basket, showing the exquisite symmetry and precision of weaving. 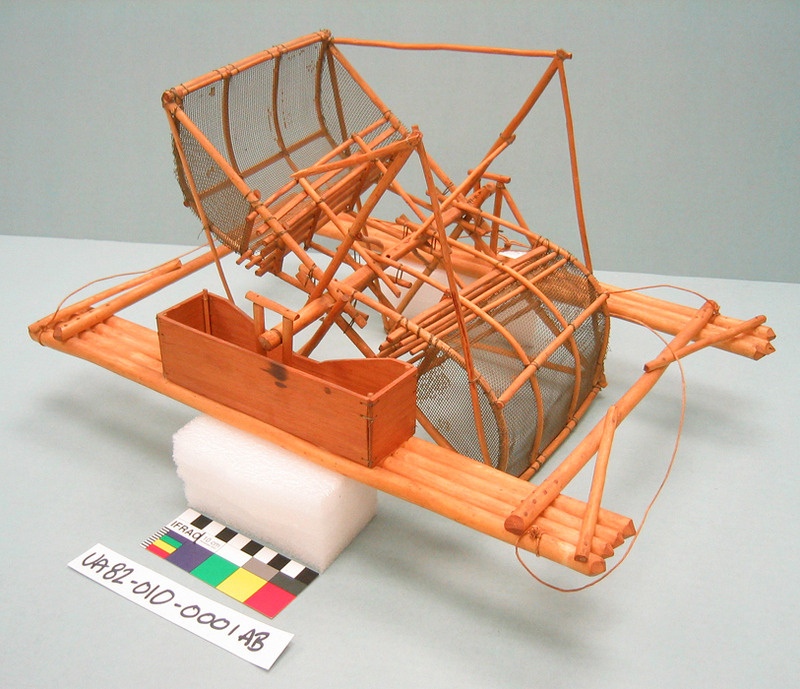 Informational document developed by Dorman to accompany his lightship baskets. 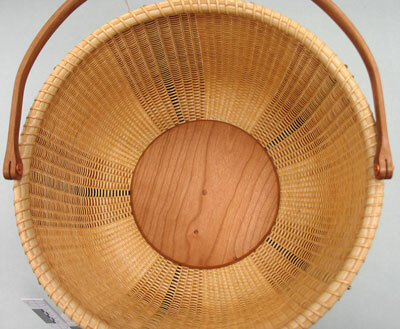 A detail of the outermost basket, showing the upward and downward facing twists, in addition to the baleen and cherry staves. Every year, generous individuals donate important and beautiful objects to the Ethnology & History collection at UAMN. They do this for a variety of reasons: to contribute to the rich resources of the Museum; to give back to the people of Alaska; to enhance the educational opportunities of students and researchers; to fulfill a wish of a family member; and even to get a good tax deduction. Whatever their reason, 99-percent of our collections come to us as donations and we are ever so thankful for the generosity of those individuals. Because we can only exhibit a small portion of our collections each year, we typically put out the new acquisitions at our Open House, which used to take place in December. Open House now occurs in the spring, several months into the new year and the immediacy of the exhibition of the materials from the previous year is somehow lessened. As a way of reaching another audience, I will present the donations of 2011 over the next few days. 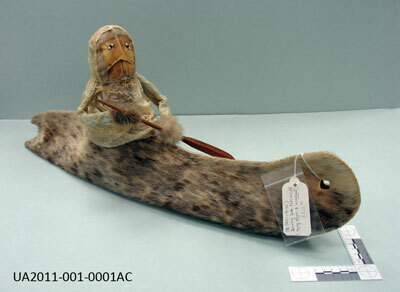 This doll is made from sealskin, is wearing a gut parka, and is paddling a Bering Sea style kayak, also made from seal skin. 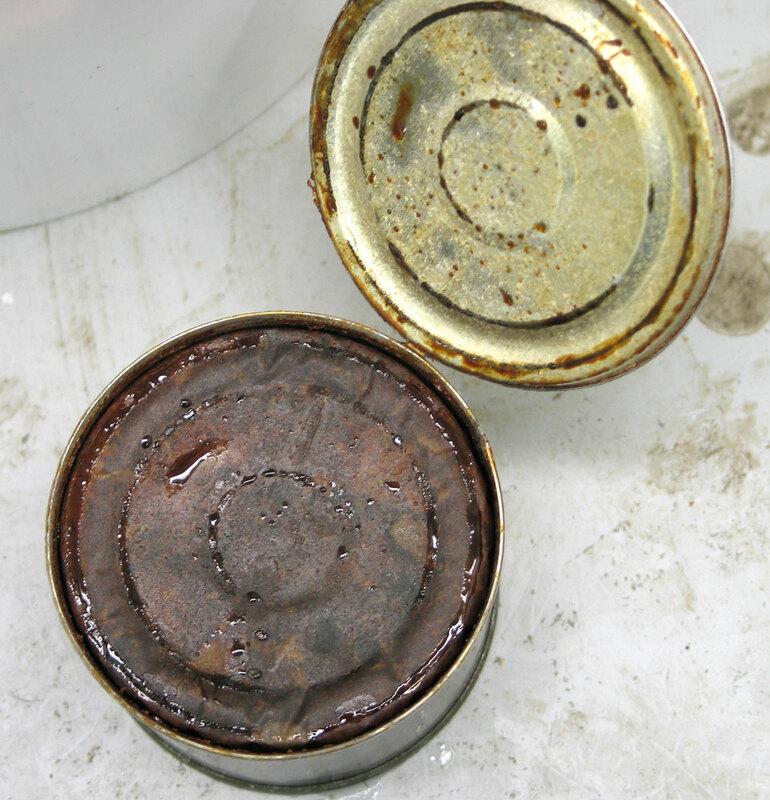 It was purchased in Arizona in 2011, was probably made in the Chevak region, and was made sometime in the last twenty years. It measures 25 x 65 x 18 cm. Chair used by President Harding. 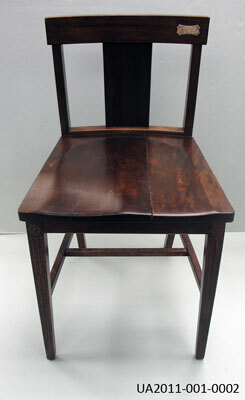 This small wooden chair was purported to be used by President Warren G. Harding on July 15, 1923. This was, of course, the day Harding drove the golden spike in Nenana, signifying the completion of the Alaska Railroad. Where this chair was sat upon, is the mystery… possible locations might include the rail car that transported him and his entourage to Nenana; the Nordale Hotel, which is where the party stayed in Fairbanks; or perhaps some restaurant where they ate somewhere in between? I’d love to hear from anyone up on Harding history. 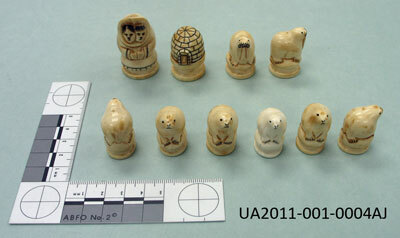 Candy also donated a lovely Aleut wall pocket sewn from sea mammal intestine, and these ivory carvings, which include a walrus tusk reputedly created by Happy Jack, a group of chess pieces, and a set of igloo salt and pepper shakers. 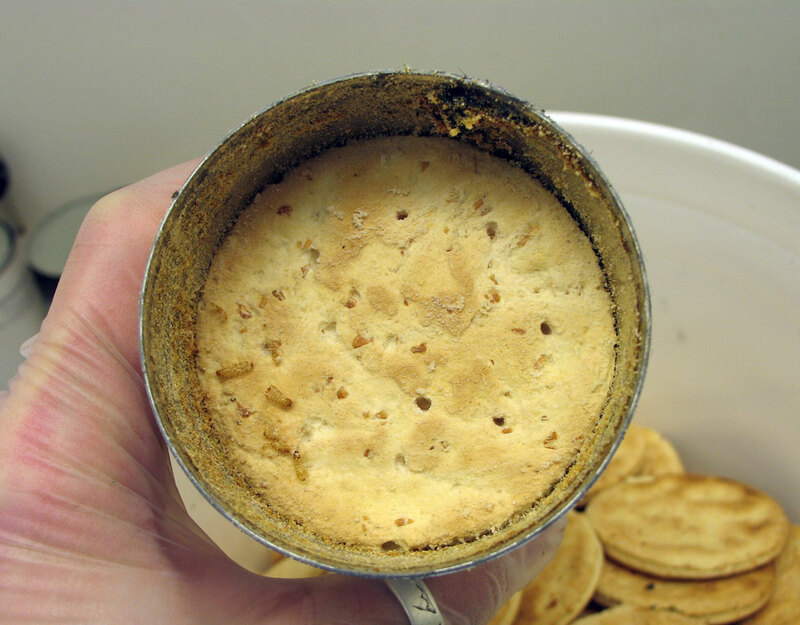 Wall pocket made from sea mammal gut. Igloo salt and pepper shakers. During my fifteen years at the UAMN, I’ve been lucky enough to be on both sides of the “student assistant” job title. Starting in 1996 as a fresh MA student at UAF, I managed to get hired for student wages in the Ethnology & History department at UAMN. My curator and MA committee chair, Dr. Molly Lee, saw my enthusiasm and educational background combined with a strong baseline of collections work experience and gave me a chance to contribute to our mission. Ethnology staff using a new "hands-on" collection piece, 1996. Copyright UAMN. 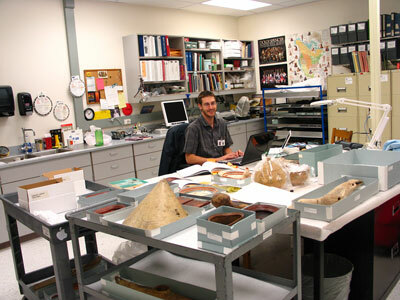 During the three years of grad school, my responsibilities in the collections lab went from being a “curatorial assistant’s assistant” to being the primary collections representative under our curator. After I graduated, I was lucky enough to get hired on as permanent staff, a position I am lucky enough to still hold today, despite budget cuts and economic downturns. As a student employee, I had the opportunity to learn from senior staff in MANY different museum departments who were generous enough to act as mentor to me. As those long-term staff retired, I have suddenly found myself in the position of being one of those holding the institutional memory and mentoring all new students who are navigating their way through the uncertain days of their undergraduate and graduate careers. 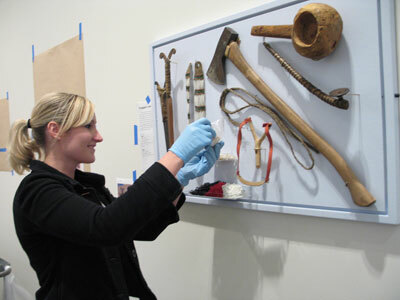 Micole (Van Walbeek) Ogletree, 2008, installs objects for a special exhibit. Copyright UAMN. 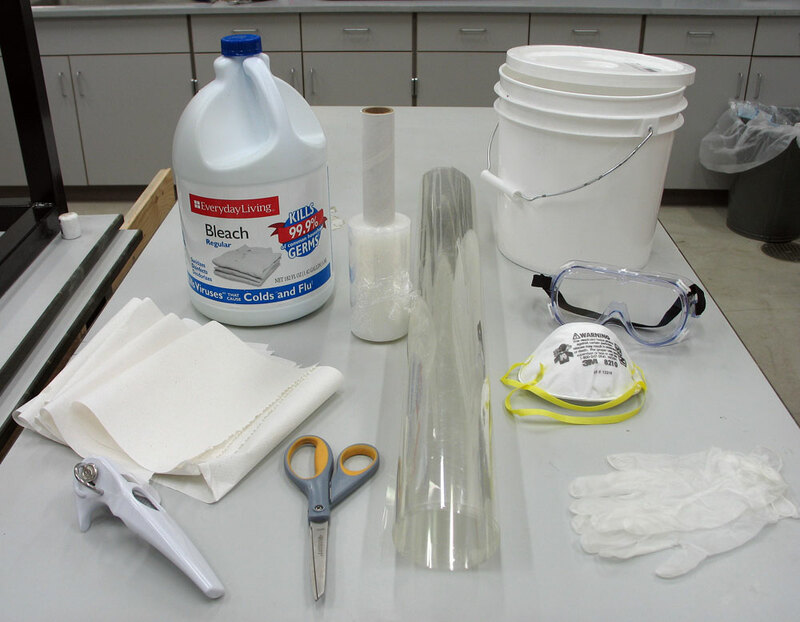 Each school year (depending on the economy), I am able to hire at least one student to work in my lab to undertake basic collections management work. In addition, each summer I take on a student intern for an intense 6-week period of collections management and exhibition development. John Smelter, 2009, works on preparing objects for his exhibit. Copyright UAMN. 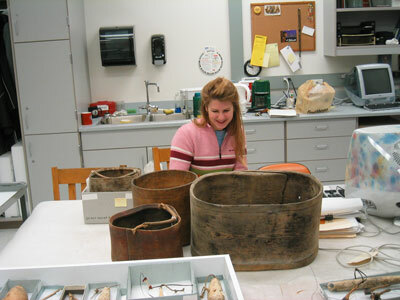 Since Molly retired in 2008, I’ve found that I have less and less time to do the work I truly love, the hands-on lab work, cataloging, making boxes, and fine-tuning of collections organization. More often than not, I have to delegate this good stuff to my students. 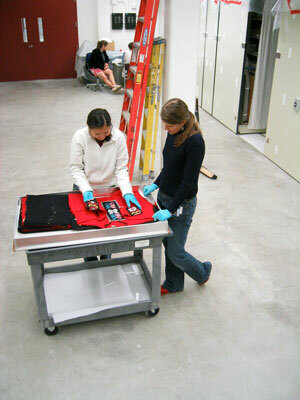 Jen Crane and Pascale Jackson, 2004, packing history objects for our move. Copyright UAMN. It takes time to train new students every year and to continue to provide them with support during the day for answering questions and keeping them moving in the right direction. But what a fulfilling way to add to the academic training of our students! Talk about a win-win scenario! We are achieving our mission of education and preservation all in one activity! 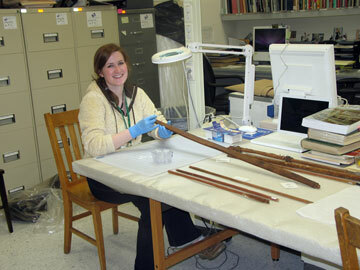 Leah Bright, 2011, removes old numbers from new accessions. Copyright UAMN. These young people help keep me connected to our popular culture when it’s so easy to become disassociated while working in the basement all day… the new music and celebrity icons are just the start! 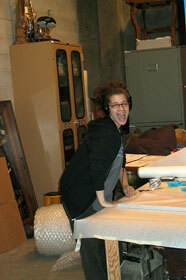 Pascale Jackson, 2003, packing collections during our museum expansion. Copyright UAMN. Young people are our new audience for the public side of our museums and it’s critical that we in the collections world stay connected to what is happening out there in our cultures… changes are occurring every day and those changes have a major influence on how our exhibits and public programs are received. I guess this is one of the small ways I have found to stay connected, while getting work done at the same time. To all of the students who I’ve been so lucky to work with over the past 15 years, I tell you again, thank you for a job well done! 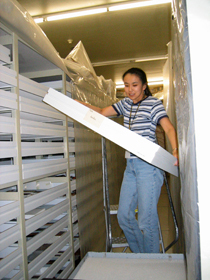 Hiroko Ikuta, 2004, removes a drawer for cleaning. Copyright UAMN. It’s been a pleasure to laugh and share hot-glue-gun burns with you. Some of you have gone on to work in museums while others have taken a different path. What is really important is the enrichment of one’s academic life that we can help provide, in addition to that paycheck (however meager!). Briana Brenner, Emily Chagluak and Charles Hilton, summer 2011. Copyright UAMN. Lyazzat Khamzina and Emily Moore, 2006, examine Tlingit beadwork. Copyright UAMN. 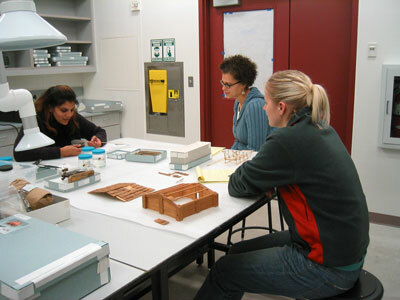 Conservator Monica Shah shows students Pascale Jackson and Candice (Smith) Krupa some basic cleaning techniques, 2005. Copyright UAMN. 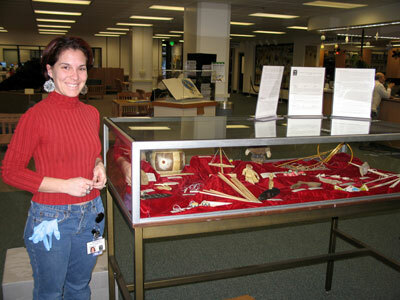 Alysa (Klistoff) Loring, 2007, and her exhibit at the UAF Rasmuson library. Copyright UAMN. Katrin Simon-Sakurai, 2005, works on rehousing bentwood bowls. Copyright UAMN.